This one is a must for natural areas. Very easy to grow and adds a natural touch. I absolutely love this plant. The flowers are amazing and adds beauty to natural areas. It has a bright white color that just radiates in the sun. Ordered several of these last year. I'm amazed at how well they are doing. I'm happy to say that my order arrived in great shape. Very pleased. Great White Trillium Trillium, also commonly referred to as the Trinity plant for its grouping of three leaves, three petals, and three sepals, are a gorgeous addition to any garden. The blooms are a pure white color, though can begin to turn a pale pink as they age. 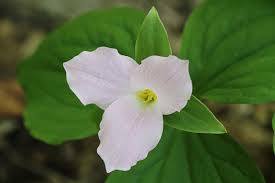 The leaves of the White Trillium are a veined dark green, with no mottling. The blooming season may vary, depending on the climate, but most Trillium plants begin to flower in mid to late Spring. Great White Trillium are excellent for smaller spaces. Reaching an average the beautiful white blooms themselves can reach four to five inches across. While other species of Trillium tend to be stand-alone plants, the Great White tend to form large drifts in the wild, making a spectacular sight - perhaps why they have always been a favorite of wildflower gardeners. Planting is best done in late fall when the plants are dormant, and partial to full shade is recommended. Native primarily to North America, the Great White Trillium thrives in evenly moist, well-draining soil, and usually requires little maintenance once planted. So long as the ground is kept damp but not soggy, they tend to take care of themselves. The plants also have the added benefit of being deer resistant, meaning that your hard work won't be eaten before you can enjoy the pristine flowers.